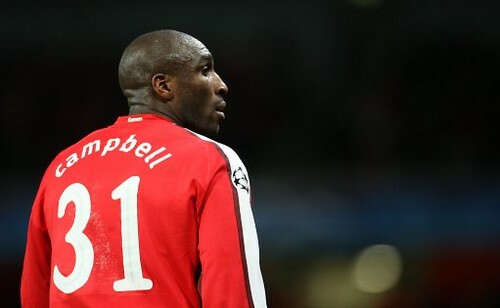 Sol Campbell, originally uploaded by Ashburton Grove Blog. Morning. Seems to be pretty sparse this morning in terms of new news on the Arsenal front. The man doing quite a bit of talking is a player who isn't shy about coming forward. Nicklas Bendtner talks to the Daily Mirror about playing as a centre forward rather than on the wing. “I am happy to play as a centre-forward, because that is my real place in a football team. It is the place on the team that I want. While in the Daily Telegraph he talks about winning the Champions League. would dominate any team in the world, we are up there with the best. “I definitely believe we can win the Champions League - why not? I am sure, we can win. We play some spectacular football, we are efficient and score goals. That is the road to success, isn't it? In the Sun, he talks about scoring a hat-trick for the first time for Arsenal. and my teammates have just laughed about it. "That is how I deal with that — I laugh. It felt incredibly good to score my first hat-trick for Arsenal. "It has been on its way for quite a while but now I have done it. It is really one of the personal goals I have wanted so much to achieve. Thomas Vermaelen, who I thought had a very good game on Tuesday, also spoke about our win with the Guardian. Like Bendtner, he believes we can go on and win the competition. "I'm convinced that we can win this competition, otherwise I wouldn't be stood here. "You have to stay focused in every game and be confident in every game. As a football player, you can never be afraid of anyone." "We've been written off twice already, I think. Can we have the last laugh? Maybe. We will see at the end of the season. "We're still in the race for the league and the Champions League. Maybe we can learn from the games against Chelsea and United." There is also a couple of lines in the Daily Mirror as well along the same lines. The Daily Mirror are catching up on the story about William Gallas being a possible summer signing for Roma. They report the Italian club's sporting director Daniele Prade was at the Grove on Tuesday to watch the Champions League game. While the Sun have report that Sol Campbell still wants to play for England. In other non-Arsenal footballing news, David Seaman is being divorced by his estranged wife Debbie, according to the Daily Mirror.